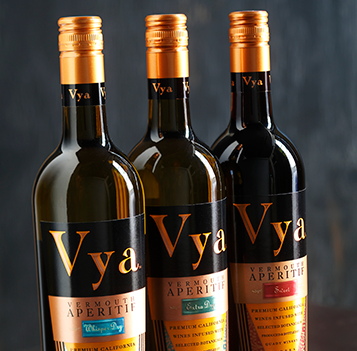 Back in 1997, Andrew Quady, the founder of Quady Winery, speaking with friends in the restaurant biz, was dared to come up with a vermouth that tastes good, and we mean GOOD. The kind of good that means you want more of it in your glass, not less. What his friends didn’t realize, was that underneath his obvious passion for making wine, Andrew has an enormous love of plants, the outdoors, and all things aromatherapeutic. Andrew spent a couple of years fiddling around with herbs from around the world – lavender, linden, gentian, galangal, orris – to name but a few, and perfumed his house up so beautifully that his family started to develop an aptitude for picking out all kinds of delicate flavors and aromas. 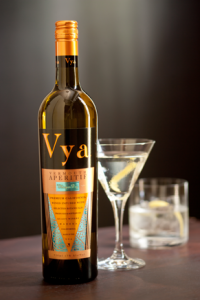 At the end of his obsession over bitter qualities balanced with sweet, Vya Sweet and Vya Extra Dry Vermouth were born in 2000. A few years later, Andy developed Vya Whisper Dry for perfect balance with vodka and other delicate spirits.